Practical - The featherweight M6000 recorder weighs in at less than six ounces. At less than four inches long and less than two inches wide, this unit fits easily into the palm of your hand or your pocket. Secure - Although lightweight and easy to carry, the M6000 recorder is no pushover. This tough customer is made of sturdy reinforced Lexan polycarbonate that shrugs off rain, mud, grease and dust. Accountable - Easily produce detailed guard tour reports by downloading data from the M6000 to a PC with the included download cradle and Windows-based software. A full download takes only about three minutes. And you can export the data to Microsoft Excel or other databases. Flexible - Choose the right system for your specific needs. ARES EXPRESS offers simple rounds tracking at an attractive price. The advanced ARES IV system adds support for incident tracking with an optional incident pad. ARES Express offers easy rounds tracking. Ideal for guards and other security personnel, hospital or nursing home staff, cleaning crews - any situation where you need to be able to verify when your personnel have visited specific locations. The ARES IV system offers all the advantages of the ARES Express, plus incident tracking. With ARES IV, your personnel can use a handy optional incident pad to record more information about conditions they encounter while completing their rounds. You can program up to 9,999 incident codes to capture dteailed information about the conditions at each station. Each M6000 recorder can hold up to 4,000 transactions. They are powered by three "AAA" alkaline batteries, with an approximate life span of one year (or 500,000 transactions). 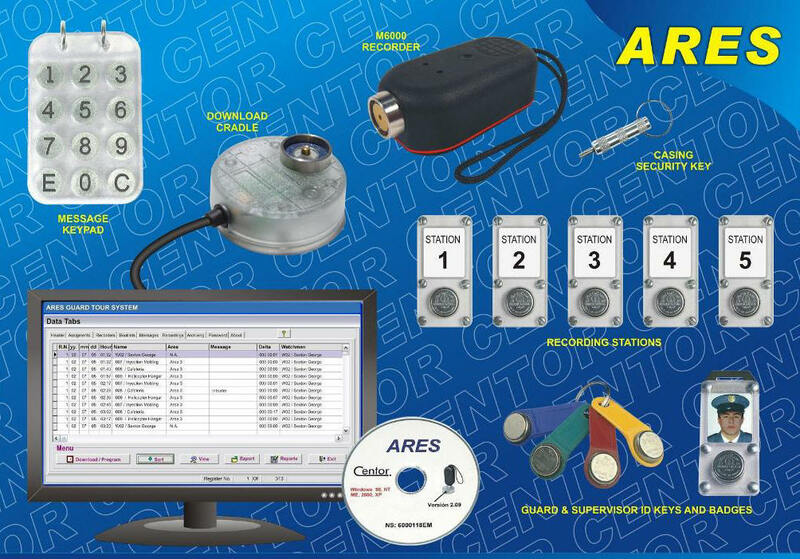 ARES Express comes with Software and User Manual on CD. M6000 recorder with carrying case. PC docking station. One supervisor key. Five recording station iButton mounts, and five iButton recording ststion buttons. ARES IV comes with Software and User Manual on CD. M6000 recorder with carrying case. PC docking station. Two supervisor keys. Ten recording station iButton mounts. Ten iButton recording stations. Optional incident tracking (with purchase of incident pad, available separately).